“Wake up the world! Be witnesses of a different way of doing things, of acting, of living! It is possible to live differently in this world,” Pope Francis said, about living the consecrated life, today. 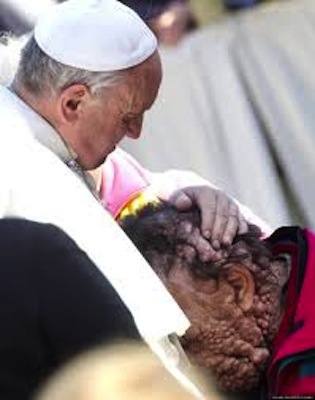 Embraced by Pope Francis: Vinicio Riva, plagued with neuerofibromatosis: 'He didn't have any fear of my illness', Vinicio said, 'He embraced me without speaking…I quivered. I felt a great warmth'. It was an embrace that melted hearts worldwide. ‘If I then, your Lord and Teacher, have washed your feet, you also ought to wash one another’s feet. For I have given you an example, that you also should do as I have done to you” (John 13:13-15). When the time comes for the Eucharistic Banquet, Christ again stresses the need to serve. “For the Son of Man also came not to be served but to serve, and to give his life as a ransom for many” (Mark 10,45). Q. What is Jesus saying to you in your life, at this time? Where is he leading you out? For information about the Redemptorist Vocation and Charism within the Church, click here http://www.redsvocations.ie. «WAKE UP THE WORLD!» Conversation with Pope Francis about the Religious Life: Click here for text of his conversation with religious superiors in Rome, January 2014.